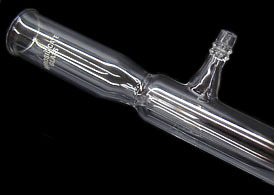 Here's a great deal on a condenser. 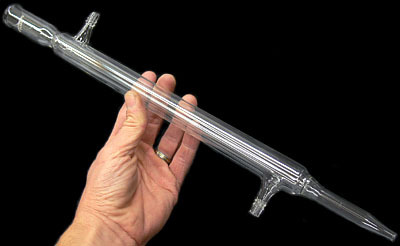 Condensers find wide usage in the laboratory for distillation, reflux operations, extraction, etc. Highly efficient, and perfect for distilling water, making or concentrating acids, extracting oils or perfumes from plants, etc. Sealed inner tube, large capacity water jacket provides efficient cooling. Far more resistant to breakage than fragile coil-type condensers. 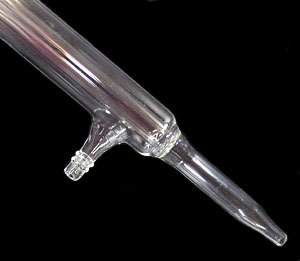 Top quality heat resistant Borosilicate (Pyrex type) glass construction. Large end fits a standard #4 rubber stopper, and the upper & lower cooling water inlets fit standard 1/4" ID plastic or latex tubing. Overall length is 18" (460mm), cooling section is 12" (300mm), and the jacket diameter is 1-1/8" (30mm). Sells for well over $100 in most laboratory supply catalogs. Large end uses a size # 4 Rubber Stopper, or size # 10 Cork Stopper. Our Pump Set works great for supplying cooling water to this Condenser if a connection to running water is not available.